...is a dream for another. I was fortunate to be the recipient of some laceweight Misti Alpaca that one of my fellow knitters just did not like. I love that yarn. It is so soft and lovely. Oh, how I long for the return of lace to my needles. I think that some of this gifted yarn will be a Sheep Shawl for me. The Christmas knitting is really coming along. I just started a purse for one of my baby chickens. I'm knitting it in Cascade 220 and using Glitterlash for the accent. I need to have it ready by Friday night. In the meantime, I've been doing some holiday baking in between cleaning and organizing projects. Fingers, don't fail me now. I first fell for Hats On! because of the Triple-Patterned Watch Cap. 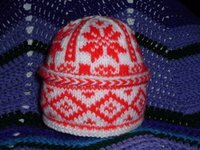 I thought it would be a great hat for me, and it looked to be a challenge to knit. One day I should knit this for myself, but this one is for my nephew. Working the Twined Herringbone edge was new for me. The yarn became terribly twisted as I worked the one round (just like the directions said), but untwisted beautifully on the next. 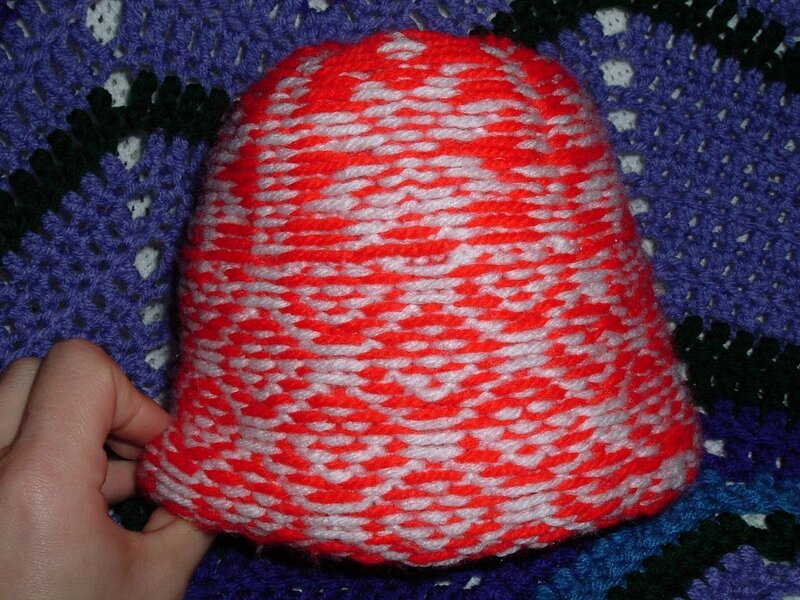 This is a fabulous hat, and it has nifty patterning on the body beneath the cuff, but it will always remain hidden. That's why I feel the need to show all of these pictures. I'm even brave enough today to show my floats. The cold rain fell on a dreary afternoon, and there was a knock at the door. The UPS man was hurrying back to his truck and I quickly pulled the bagged box into the house. What was inside? 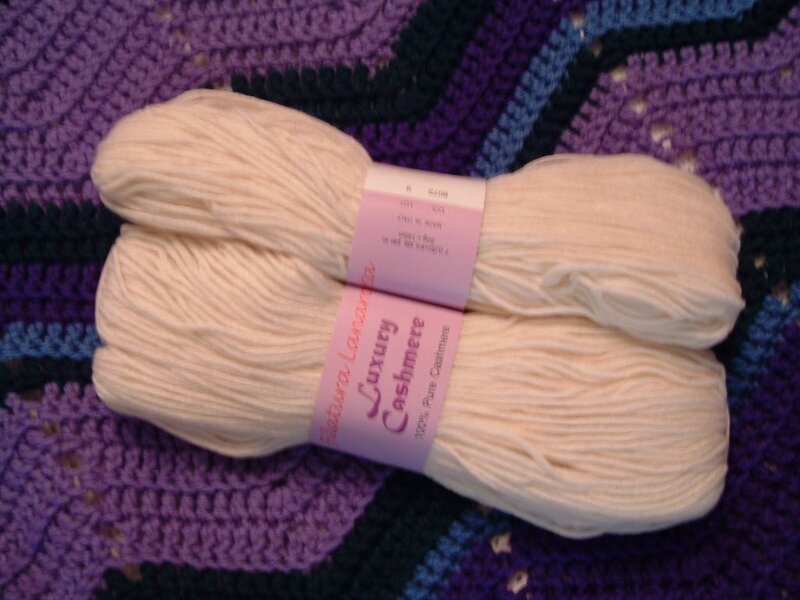 This lovely cashmere yarn from my Secret Pal. Now to determine what it is destined to become. I just need to wash these, write a Christmas note, and send them on to Alaska. The color on Cassie's hat just isn't showing up right. 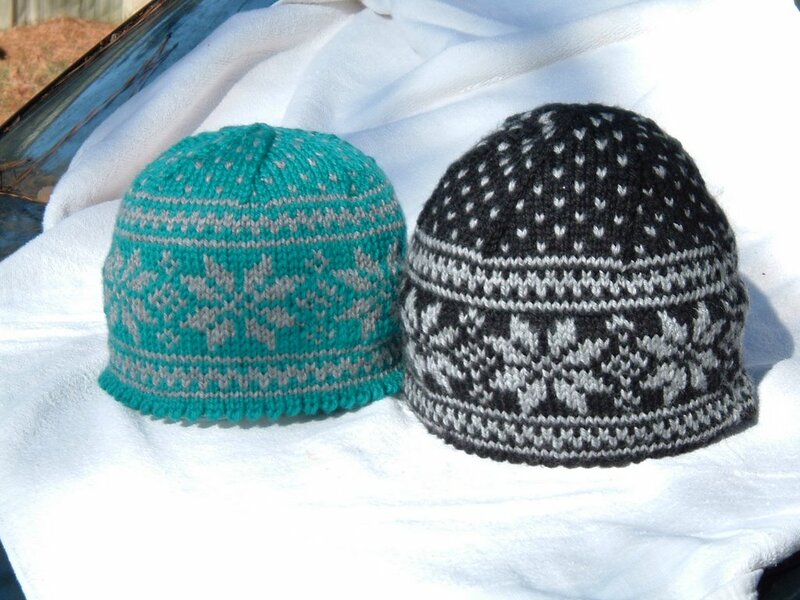 I think the hats turned out nicely; I just hope they fit well. Onto the next hat! Oh, how I am knitting along so well these days. My mind is beginning to wrap itself around more holiday knitting, and not even getting stressed about the idea. 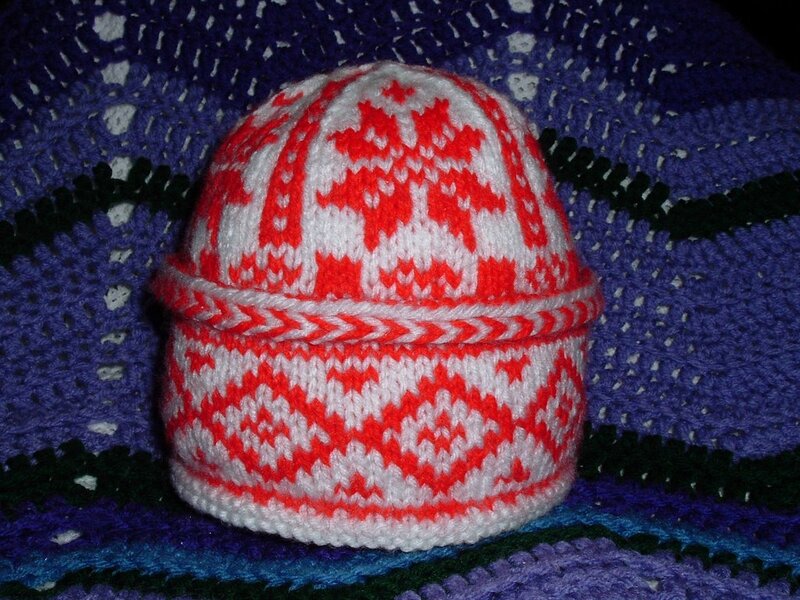 I'm about to begin the luskofte portion of the second Norwegian Stars hat. I've looked at the new Knitty, and I think I want to knit Bristow & Festive. Whoa! I just noticed that they are both knit in red. I don't know that I'd do them in red, I'm just seeing the pattern, so to speak. I'm probably going to miss my Monday night knitting group because it is Mom's birthday today and we are partying with her tonight. I've knit her a cabled headband as a little giftie. I hope I chose the correct size. If not, I'll knit it again for her. 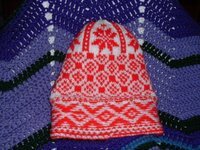 It was a joy to knit (mostly because I knew it was for Mom), and done completely without the cable needle. Mom has not much asked for knitted items, but I think this one should be a hit. She doesn't like hats (mess up hair), but her ears are sensitive to the cold and wind. This seems like it should be a match.